Family stone for Charles Conrad Hess. The stone for an infant daughter Fannie Elmira is to the left and Father Charles is to the right. Charles and his wife Mary Elizabeth Johnson, divorced in 1894 so she is not buried here. See separate entries under their names for closeups of the photos for Fannie and Charles. 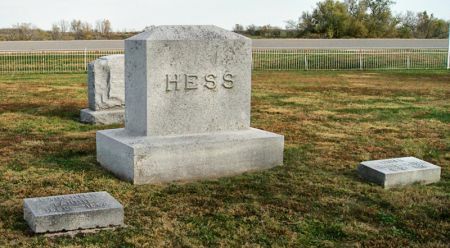 Searching for CHARLES CONRAD, FAMILY STONE OF HESS in Taylor County Iowa?